Singapore-based KrisEnergy entered an agreement to acquire Chevron Overseas Petroleum (Cambodia) Ltd. for US$65 million. Chevron's Cambodia unit holds a 30% participating interest in and operatorship of offshore asset, Cambodia block A. 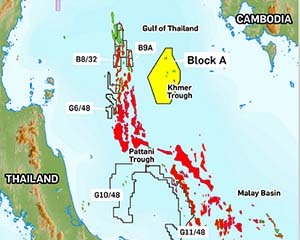 Block A, Khmer basin, Gulf of Thailand. Image from KrisEnergy. Chevron Cambodia’s 30% participating interest in Cambodia Block A will reduce to 28.5% once the Cambodian National Petroleum Authority (CNPA) completes its acquisition of a 5% participating interest in the block. Pre-transaction, KrisEnergy held an indirect 25% participating interest in Cambodia Block A, which will reduce to 23.75% post transfer to CNPA. Upon completion of the acquisition of Chevron Cambodia, KrisEnergy will indirectly hold 52.25% participating interest in the development block. Other participants in Cambodia block A are MOECO Cambodia Co. Ltd. with a 28.5% working interest, GS Energy (14.25%) and CNPA (5%) once formal transfer is approved. Block A is approximately 6278sq km over the Khmer Trough, offshore Cambodia. The contract area covers 4709sq km over the Khmer basin in the Gulf of Thailand where water depths range from 50m to 80m. The Khmer basin is the third largest basin in the Gulf of Thailand with two sedimentary features, Pre-Cambrian and Quaternary. Since the mid-2000s, extensive exploration work in this particular license area resulted in the Apsara oil discovery, most of which were discovered in 2004. A production permit application (PPA) was submitted in 2010 and updated in 2012. Phase one of the Apsara project includes 24 development wells from a single platform with oil processed then stored in an offshore storage vessel prior to commercial sales, a concept similar to other fields in the Gulf of Thailand. Production from the initial single platform is expected to peak at approximately 10,000b/d. Historically, Cambodia has no oil or gas production and the Apsara PPA is the first to be evaluated by the Ministry of Mines and Energy (successor petroleum regulator to the CNPA. Outside of the immediate Apsara development area, six structural trends have been identified and mapped as a result of 3D seismic interpretation or exploration drilling. Two additional future development phases in the Apsara area on the discoveries made to date may involve the installation of up to nine platforms, each with 24 wells. Further development across the entire license area could involve up to 44 production platforms in seven separate producing areas. The agreement includes renaming Chevron Cambodia to KrisEnergy (Apsara), once the Royal Government of the Kingdom of Cambodia receives an acknowledgment for the transaction. Joint venture partners, MOECO and GS Energy Corp. have approved the transaction.